"How I learned To Stop Worrying And Love The Bomb"
Another factoid you may not know is that the crazed character of Dr. Strangelove was apparently inspired by Edward Teller, "the father of the H-bomb"(however, it is argued that it was Stanislaw Ulam, born into a wealthy Polish Jewish family of bankers who, as the (tall) Teller-tale tells us, made Ed's highly controversial H-bomb project 'come true'...). From Wackopedia:"Throughout his life, Edward Teller was known both for his scientific ability and his difficult interpersonal relations and volatile personality, and is considered one of the inspirations for the character Dr. Strangelove in the movie of the same name." 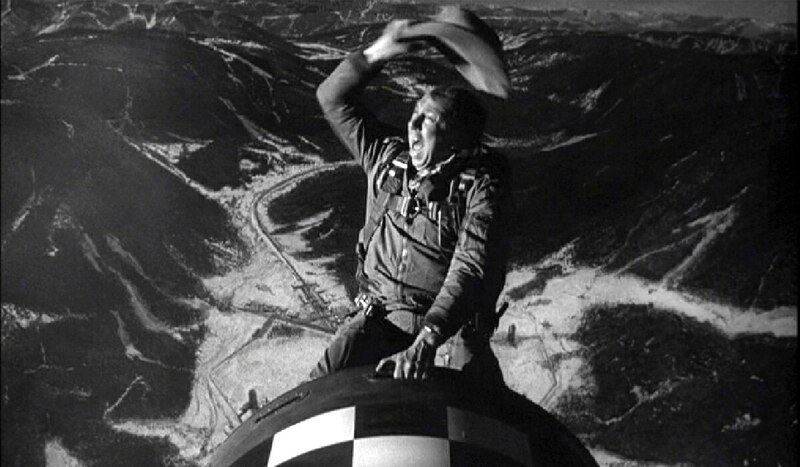 From Wonkypedia:"The end of the film shows Dr. Strangelove exclaiming "Mein Führer, I can walk!" before cutting to footage of nuclear explosions, with Vera Lynn singing "We'll Meet Again." This footage comes from nuclear tests such as shot BAKER of Operation Crossroads at Bikini Atoll, the Trinity test, the bombing of Nagasaki, a test from Operation Sandstone and the great hydrogen bomb tests from Operation Redwing and Operation Ivy." We all certainly got an eye-full of those "atom bomb tests" with that bombastic finale of Kubrick's 'Dr. Strangelove'. "Gentlemen! Our gallant young President has been struck down in his prime!" 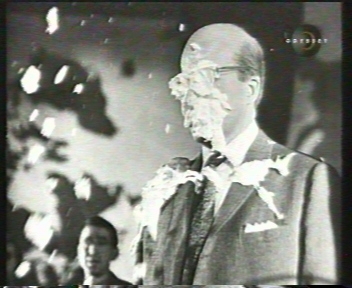 "Stanley Kubrick had already decided to cut the pie fight by the time President John F. Kennedy was assassinated, but the line (or possibly whole sequence) likely would have been cut anyway due to its eerie similarity to real events." In the scene where Major Kong reads the description of a survival kit's contents out loud, he originally says "Shoot, a fella could have a pretty good weekend in Dallas with all that stuff!" Dallas was redubbed to Vegas because of the connotations carried by Dallas in a post JFK-assassination America. It actually worked out well, as Vegas makes more sense in this context. Agreed. ["Shoot!.......Vegas"] makes so much more sense than ["Shoot!.......Dallas"]. No doubt about it ! I don't know about you - but I'm getting a growing hunch that JFK / the Nuke Hoax / and the Moon Hoax (not to mention 9/11 and Kubrick's "2001 Space Odyssey") are all part of the same...uh... 'fakery family'. Wow pretty weird connections Simon! I wonder if they had some idea to use the Kennedy assassination to trigger a mock brief nuclear exchange with the Soviet Union, which meant the movie had to be timed around that event as well -- yet later the plans changed (possibly because the probably fake 1962 Cuban missile crisis served a similar fearmongering purpose without the need of fake war) and the connections were scrapped. As to the assassination of Kennedy, you are certainly right in seeing it connected to all the rest: whether a manipulated, staged or false event, it seems today the defining moment without which much of everything that followed could not have happened. And by everything I don't mean just the Apollo hoax or the Vietnam war! but also and especially the 1968 movement, the political riots, the calls for revolution, the flower power, the protests against the war, feminism --all that. Without the outrageous injustice of the Kennedy assassination, the sheer idea of a government that is your enemy and from which you can finally part would not have been so easy and so consequential. One could also say that the Kennedy assassination was really the requirement to usher in the collective idea that democracy doesn't work. That it isn't worth the effort. That we should rather hope for destruction. The 1968 movement, and all other allegedly spontaneous protest movements and political struggles can be and often were and are the perfect way to stop short any democratic and righteous change in government, because any kind of change is at that point deemed useless in the waiting for a fantasy revolution that should come any time now. In fact these artificial revolutionary phases are often followed by much heavier and longer phases of reactionary regimes-- see the ushering in of the Bush-Reagan era. As we all know, these days fluoridation of water is the favorite fearmongering exercise of cointel agent Alex Jones; I am still amazed to see that 40 years ago this story of the fluoride in the water (unproved, fuzzy, perfect for paranoid thoughts that have no unifying answer) was already out there and yet, also, already fingered as a "fantasy for conspiracy theory kooks". Great post, Simon. I just recently watched Dr Strangelove again and was thinking about posting something about it on this thread but yours tops anything I was thinking of. I think we've all missed the point of that particular 'fearmongering tool' since it really boils down to a genuine reason to be upset, that AJ exploits. No government should drug its own people en masse, in the ["human right to"] water supply, regardless of what that drug does for good or ill. And anyway, there's a story that it was originally incorporated not to drug people but to get rid of aluminum processing byproduct in a cheap way -- have people drink it and convince them it's good for them! Alco corporation was part of the original lobby to get it done, according to legend. 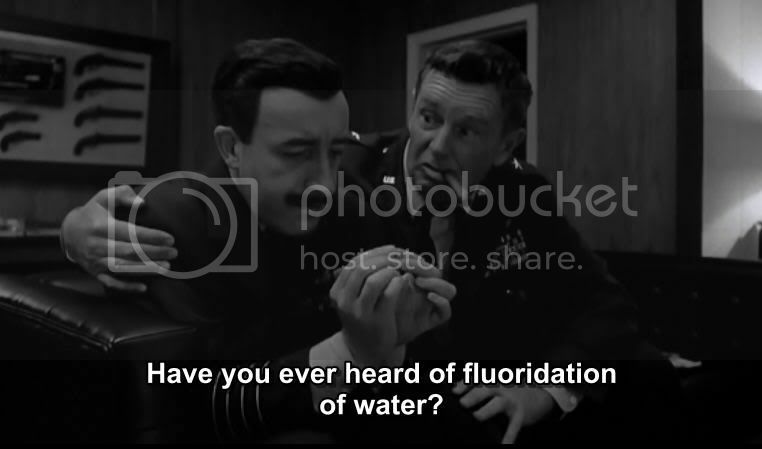 Note that in the movie, the paranoid villain is the guy ranting about body fluids and fluoride. Kind of paints people who protest it as loonies, doesn't it? And Alex Jones kind of associates himself with that caricature rather than opposing it. Because he is a caricature. A character actor who's always "in role" wherever he appears. I know this is off topic, but I think it's a subtle point. Fluoride is good for your teeth, not for swallowing. By the way, Simon, not to toot my own horn but I did mention this Kubrick flick ended with a bunch of fake nuclear explosions earlier in this thread. Glad you expounded on it in such a detailed way! Been a while - nothing much to contribute from me, but I just wanted to say what a great series of posts on this; and on other psy-op mind-benders, too. When you take a moment to think - actually THINK - about certain news stories, maybe all of them, you can see how absurd they really are. Kubrick, I believe, really was the go-to guy to make the fiction of an event into a reality. Once again, the patterns repeat themselves so blatantly. JFK, Moon Landings.. 9/11 - ALL made for TV movies. Who's the go-to filmmaker of today? Maybe Tony Scott was, before he was 'retired'. I would say Spielberg and James Cameron. Cameron specifically is one of these Hollywood hypocrites who pushes the global warming scam any chance he gets. Ha, Cameron, indeed. Yes - I've written about him before on here. He could have a thread of his own AND his ex wives! Spielberg was considered for the 'Argo job' before he was a known success. I've worked on some big films, but I'm by no means 'in there', however you do get to hear every so often on who's doing what (and who) and part of other organisations, as well as behind-the-scenes secrets fans of are completely unaware of. There are definite puppets, mouth-pieces and 'agents' in Hollyweird, but I don't think that has changed since the so-called Golden age of film, with actors spying on one another. It seems that a major component of all hoaxes is "Who benefits?" A subcomponent might include "How and by how much?" Is the "how" financial, power, a good laugh, a long-term scam, a protected industry? There are many ways for a fraud to pay out. Due to the nature of the fraud or scam, it can be difficult for the scam to be fully detected. By it's design it is a "hidden hand"-- a manipulator, not meant to be seen, but maybe even feared or fully supported by the very marks who are being duped. So it becomes difficult to get to the roots and we're left to speculate on what we can see or expose. Galen Winsor worked in "Plutonium Processing" shortly after WWII. They worked stripping uranium of the .005% plutonium weight amassing enough to meet DoD needs 10x (1965). According to Winsor the plant ran 24/7 processing plutonium. No gloves, no hazmat uniforms, no detection instruments. They would stir the nuclear water bare handed and he tells of swimming in a water containment tank. As the value of the plutonium became apparent, new instructions arrived that set exposure limits, handling requirements and instrument level readings to be taken at all times. "For Safety Reasons", plutonium (aka nuclear waste) became instantly hazardous and needed to be contained at all costs. As for compliance, he says anyone who didn't go along with whatever came down the pike would not be at work the next day. In 1960, they found out that if you waited 3 years, the materials they were working with (high-level waste! ), the million gallon containers would start boiling off 15,000 gallons of water per day. If the material broke a line and escaped the container, it would seal itself in ground within a foot and form a glass. It basically crystallized upon release. They would package the plutonium in rail cars and ship it in casks to Oak Ridge,Tennesee. There, it was made into a Barium Titanate and pressed into pellets. The pellets were so hot they would glow from the infrared heat. From here the pellets could be connected to thermal ionic converters and converted to electricity. No moving parts. They were put into the SNAP program--a NASA project!! https://en.wikipedia.org/wiki/Systems_f ... iary_Power and includes a photo of SNAP-27 "on the moon"! Check out "The Nuclear Scare" by Galen Winsor on Youtube. The above notes are what I jotted down from the vid. He seems to believe in the explosive powers and for all I know there may be explosive properties to materials that can generate radiation frequency, infrared heat and such. But it's obvious that the tale told is far different than reality. The scare tactics seem to be to keep knowledge as far away from truth as possible--much like sealing investigation records for 100 years. Scare the hell out of people and make sure no one goes near this stuff!! Galen goes on to talk about the High Level Waste Disposal Act that schedules this "high level waste" to be permenantly disposed of. So, build all these nuclear reactors--not for the purpose of supplying energy, but for manufacturing "nuclear waste". 1 ton of uranium (or plutonium?) produces $10,000,000 worth of plutonium supposedly. The electricity customers (aka public, aka sheep, aka marks) are being charged for the manufacture and disposal of something they a) likely never see a direct electrical benefit from (due to it being a hoax), and b) something so valuable they will likely never see a direct benefit from either-- financially or energy-related. Interviewer: "How dangerous is a nuclear reactor plant?" Galen: "A nuclear reactor is just a way to boil water that's the cleanest, neatest, most economical way to boil water that you've ever seen. And so in my estimation, nuclear reactors should be insured in the same insurance policy as any other steam boiler plant, power generating plant..."
He goes on to say China Syndrome was predictive programming--just ahead of 3 Mile Island. He worked with the guys at GE who wrote the script for how it would happen. If a nuke plant loses it's license, the insurance company pays. How much in this case? $300,000,000. Insurance scam. Anyhow, like everything, all subject to further investigation, to be proven or disproven. My disclaimer is I don't know what is real anymore. But I do know the power of human belief to create "reality" and the tendency of some humans to abuse and take advantage of others. At the end of the day, I don't have a clue if my electricity comes from burning coal or the nuke plant an hour away. I do have some pretty convincing clues from this forum to distrust pretty much everything forever after though. It also explains the manic control over nuclear proliferation. Probably 99% of the "educated" public believes in nuclear power, nuclear waste and nuclear bombs. Pretty good scam I'd say. Last edited by elmoastro on Mon Apr 08, 2013 7:01 pm, edited 3 times in total. N.Korea's ally and neighbour in Russia, Vladimir Putin, suggests the N.Korean threat would make Chernobyl look like "a fairy tale". Given what we know about nuclear strikes, this seems prescient. It must be story time! 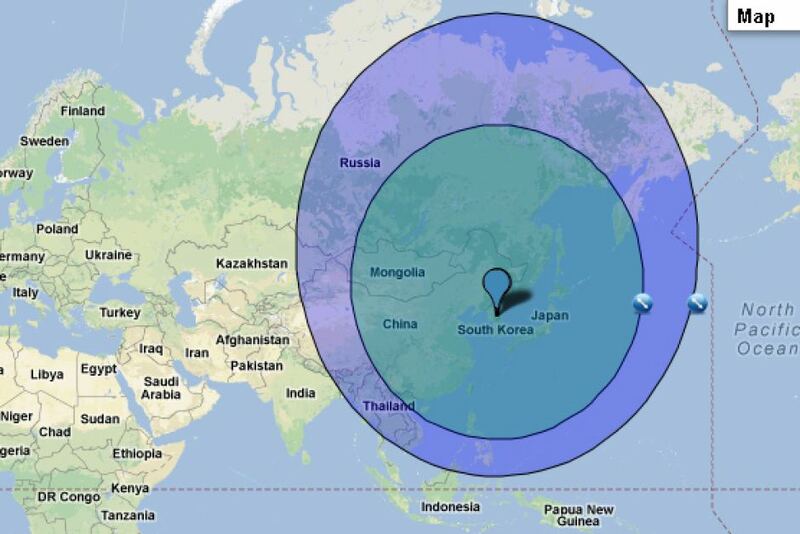 The 'musudan' missiles in the below photo can 'be tweaked' to fly up to 4,000km, which according to SNL's Weekend Update, would seriously threaten the middle of the ocean. "... the inner circle covers a 3,000km radius and the outer 4,000km"
Despite this limitation the media earlier claimed that they put a satellite into orbit around the Earth. They said the satellite then "tumbled out of control" but that story now seems to have been dropped. But, why do their missiles have such a short range yet they can supposedly put something into orbit? It’s a bit of a stormy day here in Southern Ontario, so I stayed home and investigated Feynman. I always loved him, but now that I suspect nuclear weapons as being non-existent (I’m on the fence, having just started to look into it, and suspecting that the evidence is thin on both sides) I have to suspect Feynman, who supposedly worked on the atomic bomb itself. I had an intuition last night that by investigating Feynman I might be able to figure out (for myself anyway) if the nukes are real or not. I have two of his books: Surely You’re Joking, Mr. Feynman and a hardcover called Classic Feynman, so I’ll be quoting passages. I’m very new to this so bear with me, and critique my thinking/presentation if you have something constructive to suggest. On the surface, Feynman appears to be something of a free-thinker. Wikipedia (or wickedpedia, as I’ve seen it called here) mentions how in coming upon the topic of feline anatomy, he somewhat condescendingly retorts, “Do you have a map of the cat?” Which suggests that we (people in general, including veterinarians) don’t know as much about cats as we’d like to believe. We might know the functions of the organs, but not a complete “map” that details everything. I think he’s suggesting that our “map” of biological beings still has the note “There be dragons here” somewhere on it. Which is funny, since supposedly he can map out particle interactions exactly and explain everything. But I’m not so sure. First, note that in the above link, the reasons for the rules are never given. They just are! Someone even asks about it in the comments, and the answer seems evasive. Now sure, maybe I’m not smart enough to make sense of this. But I did at least TRY to get a physics degree (I dropped out; this was after I obtained an English Literature degree). So I know a little bit here. In the diagram above, the figure on the lower-right is interesting, so let’s start there. It’s saying that the strong interaction between nucleons involves what’s called a pion (that’s what the pi symbol is supposed to mean). Okay… Either the diagram is unilluminating and not helping more than words would aid in describing the interaction – in which case Feynman diagrams serve no purpose – or the diagrams ARE supposed to be depicting something “deep”, in which case you need to believe that THIS is deep: nucleons traveling in a certain vector-direction interact and bounce off each other because of pions. But that really doesn’t explain anything. It’s the same as “There be dragons here” on a map. This is striking me as bullcrap, folks. My basic intuition is that these diagrams are NONSENSE. I know that coming on to a forum and professing to “out” physics that’s so beyond anyone’s comprehension will look like arrogant and ultimately ignorant buffoonery. But something is really wrong here. Look at the lower-left diagram. “Green-antiblue gluon.” Really? That’s supposed to be illuminating? I think it’s a distraction, to make us all think we’re just not smart enough to get nuclear physics. All right, enough with that – let’s move on. Feynman supposedly witnessed the atomic bomb tests without even protective lenses. (See Wikipedia.) He is supposed to have seen it with his bare eyes, albeit looking through the windshield of a truck. If you believed in the atomic bomb and its radiation, would YOU get near the thing? I’m starting to see that this is ridiculous. My partner’s father taught physics, so I respect that there are honest physicists who believe in the math. But it’s fishy to me. An aside: I heard on a documentary of Feynman, one of his student said that a lecture by Feynman was like Chinese food. Great initially – but a few hours later, you couldn’t remember why it seemed so clear and obvious at the time! Maybe because, when away from his hypnotizing personality, you saw that it didn't make sense? Feynman criticized NASA in investigating the Challenger incident, which supports his free-thinking image. But he supports that NASA is generally a valid operation, which we know is false. He writes about NASA a lot in his books, and it all lends credence to him being a gatekeeper “whistleblower”. The first passage is interesting. As you probably know, the space shuttle Challenger had an accident on Tuesday, January 28, 1986. I saw the explosion on the TV news, but apart from the tragedy of losing seven people, I didn’t think much about it. In the newspaper I used to read about shuttles going up and down all the time, but it bothered me a little bit that I never saw in any scientific journal any results of the experiments on the shuttle that were supposed to be so important. So I wasn’t paying very much attention to it (Classic Feynman, p.383). So here Feynman verifies that the shuttle trips are scientific, but maybe not worth the taxpayer’s money. I think it’s very telling that he says nothing ever came of their experiments. I wondered that too; what were they doing up there? But Feynman will come to embrace the astronauts, and make us feel like they’re a bit of a waste of money, but harmless, and that the science is real. Mr. Weeks said there was a rumor that the history of the seals problem was being leaked to the newspapers. That bothered him a little bit, because it made NASA look like it was trying to keep things secret (Classic Feynman, p.400). At the museum there was a special theater with a movie about NASA and its achievements. The movie was wonderful. I had not fully appreciated the enormous number of people work were working on the shuttle, and all the effort that had gone into making it. And you know you a movie is; they can make it dramatic. It was so dramatic that I almost began to cry. […] After seeing this movie I was very changed, from my semi anti-NASA attitude to a strong pro-NASA attitude (p.401). My cousin Frances educated me about the press. She had been the AP White House correspondent during the Nixon and Ford Administrations, and was now working for CNN. Frances would tell me stories of guys running out back doors because they’re afraid of the press. From her I got the idea that the press isn’t doing anything evil’ the reporters are simply trying to help people know what’s going on, and it doesn’t do any harm to be courteous to them (Classic Feynman, p.413). In science you learn a kind of standard integrity and honesty. In other fields, such as business, it’s different. For example, almost every advertisement you see is obviously designed, in some way or another, to fool the customer. : The print that they don’t want you to read is small; the statements are written in an obscure way. It is obvious to anybody that the product is not being presented in a scientific and balanced way. Therefore, in the selling business, there’s a lack of integrity (Classic Feynman pp.462-3). So Feynman lauds science by talking about advertising crookedness. In sum: my basic hypothesis is that Feynman was employed to show how scientists can figure out reality just by thinking about it, and we should take their word for it. When really we don’t know a thing. But he could convince everybody that NASA and nukes were for real, when really they’re not. That’s all I have for now; I’m off to read more about his involvement in Los Alamos. Thanks for letting me have my say. Jove wrote: Thanks for letting me have my say. Thanks for your interesting contribution, Jove. I'd never heard of Feynman - I must admit my ignorance of this funny fellow's very existence! Richard Phillips Feynman was born on May 11, 1918, in Manhattan, New York, the son of Lucille (née Phillips), a homemaker, and Melville Arthur Feynman, a sales manager. His family originated from Russia and Poland; both of his parents were Ashkenazi Jews. "Known for his work on the Manhattan Project and for his book 'What Do You Care What Other People Think?,' which explains how he determined the cause of the Challenger disaster, Feynman possessed an uncanny ability to not only make science interesting, but humorous and entertaining as well." "Humorous and entertaining". Indeed: 'What Do You Care What Other People Think? seems a fitting statement from what appears to have been yet another silly clown of our planet's "scientific" community. Yet his lectures on physics are very popular for a reason. For the little I have seen of them, they make a great read and explain complex problems in an understandable manner at least when they go over the founding principles of modern physics. Of course Feynman had a criminal part in the nuke hoax, granted: but this does not mean he was just a scam artist and a clown. The most likely possibility is that he was a very brilliant scientist. The scam would never have worked without the collaboration of real scientists providing the scientific framework, the approval and support of the academy to the "discoveries". As to the laudable efforts of Jove to tell us why those diagrams are "bullcrap", I am afraid the efforts are a bit vane. I couldn't tell before and I can't tell now. The fact that you Jove, me, or a million other people do not understand certain explanations or calculations, or even declare them nonsense, proves nothing unfortunately. One could do the same with Euclide's theorem. One could call it "nonsense" to a public not familiarized with it and that public would clap relieved at the idea that it is not necessary to study it. I'd stick to the propaganda around the bomb which by itself is enough to call the whole thing a scam. Fair enough, nonhocapito. My partner often provides that kind of logic to my rants. I knew I was going a bit far with it, I’m just glad I’ve got a place to discuss things like this without being immediately rejected as insane. I will point out that this website that purports to explain how to draw Feynman diagrams is a bit bizarre. Apparently it’s easy to draw them, even kids can do it! You don’t need to know anything about particle physics either, but you can draw lines and they’ll explain everything! Here we are taught how to draw straight lines. Just think of a shoelace! Maybe I just don't get the joke? Wonder who may be profiting in financial markets from these N Korean tests? In 2006 the KOSPI dropped up to 3.58% in the first test and in 2009 it dropped as much as 6.3% for the second test. Anyone with pre knowledge of these events could have shorted the market with put options and made out like a bandit. Defence related shares are soaring on all this gloom and doom, however.